Today, my latest interview on 'Red Ice Radio' has been posted -- where show host Henrik Palmgren and I discussed my Kentroversy Special Report entitled 'THE MICROCHIP AGENDA: Would You Like A CHIP To Go With That Hot Dog?' -- a report that was originally published on August 22, 2005. However, this report is more prescient today than it was on the day it was originally published! While this might sound comforting to some -- to me it sounded ominous and frightening. Thankfully, I still had a choice about whether or not I wanted to subject my new dog to this -- something that I will NOT be taking myself. In some countries -- such as Australia for only one example -- the microchipping of pets is now compulsory. I wonder HOW LONG before this will be REQUIRED in the United States?! I also gave an update on my health situation -- as well as having made an EXCLUSIVE ANNOUNCEMENT regarding the publication of a forthcoming book I am working on regarding the American Mass Media. The book will be published some time in 2008 -- and will be published by KENTROVERSY MULTIMEDIA GROUP -- my own self-publishing label. I cannot say much more than this at the moment -- as I have some copyright and trademark issues to iron out first. As soon as those details are worked out -- I will release further details at that time. I highly recommend that ALL listeners check out this material -- as the plan is for YOU AND I to be implanted with these chips! On this current edition of the OCCULT OF PERSONALITY podcast -- myself, occult historian and author Tracy R. Twyman, and esoteric researcher Todd Campbell of Through The Looking Glass all got together for a seventy-five minute roundtable discussion on the work of horror writer Howard Phillips Lovecraft. 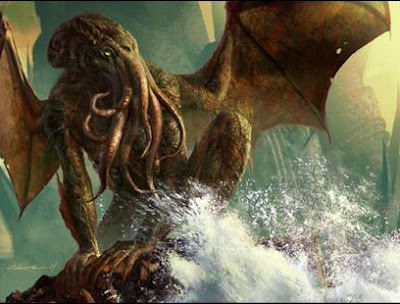 Above, we have an artistic rendering of Cthulhu -- perhaps the most well-known of all the Lovecraftian entities. “The most merciful thing in the world, I think, is the inability of the human mind to correlate all its contents. We live on a placid island of ignorance in the midst of black seas of infinity, and it was not meant that we should voyage far. The sciences, each straining in its own direction, have hitherto harmed us little; but some day the piecing together of dissociated knowledge will open up such terrifying vistas of reality, and of our frightful position therein, that we shall either go mad from the revelation or flee from the light into the peace and safety of a new dark age. On episode # 27 of the 'OCCULT OF PERSONALITY' podcast -- I participated in a fascinating discussion on the work of H.P. Lovecraft -- an influential horror writer of the early 1900's. It was a roundtable discussion -- where three people besides myself talked about how we got into the writing of this author -- who was writing about many things that were provocative to say the least! What I personally found fascinating about Tracy's, Todd's, and Greg's introduction to Lovecraft -- was how similar our experiences happened to be. As a writer, he influenced H.R. Giger and the Alien films as was pointed out during the discussion itself. In addition, in his 1981 textbook on the history of horror-fiction -- both in films and in written literature -- Stephen King continuously praises the works of Lovecraft. It was through my appreciation of King's work, that I eventually made my way to Lovecraft and his many extra-dimensional horrors. Tracy, Todd, and Greg also told how their own discovery of Lovecraft and his work had affected their lives -- and the work they do today in the esoteric research field. In all, it was a captivating discussion -- and I am happy to have been picked to participate in this roundtable. And, if anyone listening would like check out some excellent BIZARRE FICTION -- I submit that the reader/listener will not be disappointed by their own discovery (or rediscovery) of Lovecraft and his work. On this 14th edition of the KENTROVERSY TAPES PODCAST, we have our good friend Greg, from the OCCULT OF PERSONALITY website and podcast, who is returning for another of his regular visits. Tonight, we are going to talk about "Where is the world I was promised as a child?" On the 14th episode of THE KENTROVERSY TAPES -- my good friend Greg from the OCCULT OF PERSONALITY website and podcast stopped by for another of his regular visits. Tonight, we discuss the thing that quite a number of us have on our minds these days -- "Where is the world I was promised as a child?!" This discussion led us through many interesting topics and concepts -- and they certainly were interesting to ponder. Greg and I talked about how we discovered this -- and what effect it had on us as young men still in school. We talked about the anger it fostered in us -- and how we were able to turn anger into real solutions. Those solutions form the basis of the end of our discussion -- and I think the listener might be surprised to hear how simple they really are to implement into their own lives. I Was Promised As A Child?" "Where Is The World I was Promised As A Child?" 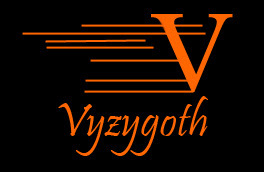 On the episode of Vyzygoth's 'From The Grassy Knoll' that was released today, Vyz and I talked about the report I had written on false-flag terror attacks -- ANATOMY OF A FALSE-FLAG TERROR ATTACK. We also talked about Osama Bin Laden, and whether or not he is alive or dead -- plus much, much, more! My usual monthly visit to FROM THE GRASSY KNOLL was of course interrupted last month by my month-long illness from a severe Hepatitis attack. However, now that I am doing much better -- I have been able to resume my work schedule. This month, we talked about FALSE FLAG TERROR ATTACKS -- and my 10,000 word report on the subject -- a link for which can be found in the SOURCES section below. We mentioned a few of the historical examples of such attacks -- and in the report I list many of these both within the United States -- as well as historical examples outside of the United States. Vyz mentioned that he has a pilot friend who claims that the airplane disappeared into the hole in the Pentagon on 9/11 -- which I immediately mentioned to my own eyes and logic -- appears to have been made with a missile rather than a plane. I mean, honestly, can aluminum penetrate both concrete and reinforced steel and iron beams?! Absolutely NOT! "Children should be removed from their families and brought out to the country- side to be taught by the philosopher Kings." And, as always -- THANK YOU for listening aand for your unwavering support! On this 13th edition of the KENTROVERSY TAPES PODCAST, we have John Hogue, the world's foremost authority on Nostradamus. John is also a prophecy scholar, and on this broadcast, he and I talk about some things to come -- such as WHO it will be that will win the Presidency in 2008. John Hogue, the world's foremost authority on Nostradamus. On this broadcast of THE KENTROVERSY TAPES -- I am proud to have as my guest John Hogue, a very intriguing man, to say the least. John is a prophecy scholar AND the world's foremost authority on Nostradamus -- the man with the mysterious poetic-like predictions of our future -- such as the many pre-millennial predictions of events that would come to pass with the new century. While it is true that most people have HEARD the name Nostradamus, and perhaps may have even heard one or more of his quatrains -- four line poem-like verses that contain the predictions -- such as the one we've been hearing about lately which is related to this Anti-Christ figure MABUS. I first heard of Nostradamus in Junior High School when I heard about this prediction involving HISTER, which was represented in a friend's book as an anagram for HITLER. I was very intrigued, and Nostradamus formed a curiosity which has continued to this very day. John spoke about the in's and out's of what he called "the cycles of history," and he also spoke about prophecy, and what it is, as well as what it isn't. We also talked about many things that relate to future events -- including the Presidential election next year. The listener may be surprised to find out WHO IT IS that John Believes will be occupying the White House, beginning in January 2009! This is one of the best episodes thus far of THE KENTROVERSY TAPES! NOTE: I would like to thank my good friend Vyzygoth of THE GRASSY KNOLL radio show for introducing me to John Hogue -- thanks Vyz! 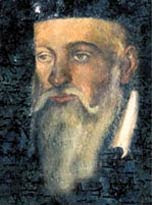 I would encourage all interested in the NOSTRADAMUS story, to check out the websites listed below, which are excellent, and well worth your attention and your time. Mike Hagan's Radio Orbit radio show featured a two-hour discussion on 9/11, between him and myself. I brought up several aspects of the story that no other journalist has wanted to cover, even the so-called major truth-tellers, such as Jeff Rense and Alex Jones. Last night, I made my first-ever appearance on Mike Hagan's Radio Orbit radio show, which is broadcast on KOPN 89.5 FM, out of Columbia, Missouri USA. The subject of the show was the Sixth Anniversary of the 9/11 Attacks. As is my journalistic specialty, I strive to provide information that no other journalist wants to touch. And last night's interview was no exception. I began by talking about 9/11 as the largest case of insurance fraud in the history of the United States. I mentioned how Larry Silverstein and his partners were able to make BILLIONS OF DOLLARS in profits off the WTC attacks -- instead of his having to spend an estimated $10 BILLION DOLLARS -- to dismantle the twin towers piece by piece -- just as they had been constructed. Mike Hagan and I also talked about government foreknowledge, and the USA PATRIOT ACT -- an 800+ page bill that had been pushed through Congress within a month of the attacks. Members of Congress were told in no uncertain terms that their lack of support of this bill would be looked upon by the White House as TREASONOUS BEHAVIOR. We talked about War Gaming exercises that were being run out of the Port Authority dock on the Manhattan shore on 9/11. FEMA officials and others flew into NYC the night before, on September 10, 2001 to participate in the War Gaming exercises of the next morning. I also mentioned the unknown fact that on the morning of 9/11 -- George Bush Sr. had breakfast with the brother of Osama Bin Laden -- who had come into Washington, DC on Carlyle Group business. Mike and I also talked about the reasons WHY I am absolutely certain that the Osama Bin Laden audio and video tapes are forgeries -- as they use the green-screen technique of Hollywood feature films. We had an excellent discussion -- and Mike had said some very nice things about my commitment to truth. I would like to thank Mike Hagan for his hospitality and for inviting me on his show. I had a wonderful time, and it is my hope that I provided some interesting information to Mike's listeners. 9/11 was an INSIDE JOB ... !!! On this 12th edition of the KENTROVERSY TAPES PODCAST, we have Jeff Wamsley, the curator of the world's only museum dedicated to the MOTHMAN -- one of the most interesting crypto-zoological phenomena that has ever visited small town America. In this 12th episode of THE KENTROVERSY TAPES, I sat down with Jeff Wamsley, of Point Pleasant, West Virginia. Jeff is the curator of the world's only MOTHMAN museum, which is located in Point Pleasant. I was keen to discuss this with Jeff, because the MOTHMAN story has many interesting aspects -- crypto-zoological phenomenon, encounters with UFO's and real-life Men-In-Black, a real-life Indian curse, and of course, prophetic future-telling. Jeff and I discussed the area's background, along with a full recounting of the MOTHMAN story. We also talked about the 2001 film that was made from the book by John Keel, entitled THE MOTHMAN PROPHECIES. The film starred Richard Gere, Laura Linney, and Will Patton -- one of the best character actors in all of Hollywood. 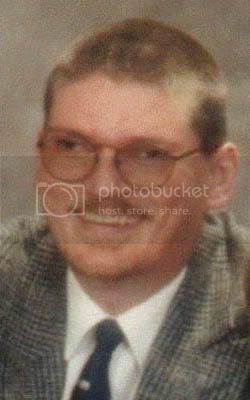 I would encourage all interested in the MOTHMAN story, to check out the websites listed below, which are excellent, and well worth your attention and your time. On this special edition of THE KENTROVERSY TAPES podcast, I sat down with my good friend Greg of the OCCULT OF PERSONALITY podcast and website, to discuss my absence during the entire month of August. In this special episode of THE KENTROVERSY TAPES, I sat down with my good friend Greg of the OCCULT OF PERSONALITY podcast and website -- to discuss my month-long absence from all of my research, journalism, publishing, and broadcasting activities. 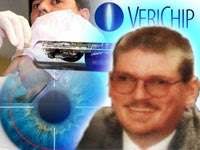 Because of the overwhelming response I have gotten from my readers and listeners, along with my steadfast commitment to TRUTH in all its' forms, I felt that the very least I could do, was to provide an explanation to all who took the time to write me e-mails, call me on the phone, and send me well wishes and healing energies, and prayers. I won't get into the details of my absence here, as it will be a much more complete explanation for you -- the listener -- to simply listen to the 31 minute discussion. I wanted Greg to assist me in this conversation, as I feel that it would have been far too boring to listen to me give a half-hour monologue. I know that I certainly wouldn't want to listen to something like that, and I feel the listener wouldn't either. Next week, THE KENTROVERSY TAPES will resume its' normal production schedule, with its' next episode due to be made available on September 10, 2007. The subject of that episode will be THE MOTHMAN -- as I talk with the curator of the official MOTHMAN MUSEUM in Point Pleasant, West Virginia USA. Thank you for your understanding of my situation, as it has been described in the discussion itself. I would encourage all interested in the GERSON THERAPY, to check out the websites listed below, which are excellent, and well worth your attention and your time.